CRISP Social Ventures India (CSVI), the on-ground extension of the Chevening Rolls Royce Science & Innovation Leadership Programme (CRISP), has launched PowerHouse, a global collaborative mission to design and enable a solution to conceptualise sustainable houses for the rural poor. "Owing to the lack of sufficient facilities, the shortage of housing and the difficulty in obtaining funds to purchase a house, the concept of renewable energy powered houses was established”, CSVI said in a release. By ensuring that the house is affordable and funding is not very difficult to arrange, Powerhouse will ensure upliftment and a better standard of living for the occupants on a sustainable basis. What exactly is powerhouse? According to its website, "Powerhouse is a global collaborative mission to design not only a house, but even the process of enabling such a solution to the potential end users. Renewable sources of power can be harnessed to develop a standardised solution, becoming an integral part of the house. Think solar, think wind...think beyond. Powerhouse will be a house, which will not only produce its own power, but will be able to generate excess power. Powerhouse will do at least three things economically. First and second, it will make money for their inhabitants as they sell back the excess power to the grid and the income pays for part of the mortgages taken to buy the homes. Third, the inhabitants will be involved in building the easy-to-erect homes, and earning thereof". At least 78 million people are homeless in India despite the country growing in global economic stature. There is a shortage of 18.78 million houses in the country, because of which, they either sleep in the open or by the roadside, railway platforms and under flyovers. At present, the mission is working at finding a solution by getting the best of minds together at the drawing board stage. CRISP has called for expression of interests from experts and corporate groups who will work on a collaborative basis. "In India, and across the globe, homes have traditionally been designed by architects and erected by contractors. All other improvements, like say installing a solar panel, are usually standalone activities, resulting in a lack of accurate integration with other services, leading to inefficient outputs. The poor in India cannot afford architect-designed homes, and thus live in poor quality, self-imagined and built habitats, with no or limited access to good hygiene, clean water and power. So what if experts designed once, and houses were mass produced; say like cars? The poor is more concerned about a reliable roof above their head, rather than a customised designer house. A collaborative team of architects, engineers, renewable energy experts, policy makers, financiers and others working together from the drawing board stage can design the process required for such mass produced “net positive” homes. It is believed that this collaborative approach, versus the ‘design in silos’ approach, will help develop a holistic, modular, standardised housing solution for the poor in India; and in the process becoming an economic development engine. According to CRISP, these projects will be initiated across India where people can then buy well designed homes, capable of generating surplus power, just as they would by a car from a showroom. However, there will be regional variations to encompass regional characteristics. Standardisation is the key, as this will lower costs, and it will bring in efficiency and quality control. Also, research has shown that the homeless and the poor in India accept standardised solutions as long as it is a 'pucka ghar'. In the beginning, these houses will be set up in states, which have introduced the concept of net-metering where one can sell back excess power back to the grid. The house owner will also be a part of CRISP’s co-operative mission. He/ she will earn (and that earning pays off the mortgage) by selling the excess power that the house will generate, the owner will also have an additional revenue stream by 'building for his neighbours'. It will be easy to build the house, where skills can be easily learned. This will also uplift people and communities socially and economically. This will be real economic growth from the grassroots level; a bottom up approach, which is the need of the hour. Note that these homes will be self-powered through renewable sources of power. The excess power will be sold back to the grid, which will be earnings for the occupants. This is possible due to the introduction of net metering in a few states across in India. The actual cost will be known once a prototype is built. However, there will be a mortgage linked to the house, and mortgage payments linked to earnings from the sale of excess power. So the house comes virtually free to the owner. CRISP is working with agencies like the National Housing Bank from the beginning. Mortgage norms can be made easier such that the poor can have easy access to them. New schemes like the Jan Dhan Yojana are steps in the right direction, as it brings the larger population into the formal sector. The Chevening Rolls-Royce Science and Innovation Leadership Programme (CRISP) is conducted by the Oxford University, UK and supported by Rolls Royce, the British High Commission in India and the Foreign & Commonwealth Office in UK. Furthering its goal towards making India economically advanced and self-reliant, the program's alumni in India, along with support groups from Oxford and elsewhere, have established 'CRISP Social Ventures India' (CSVI). CSVI undertakes mentoring and incubation activities for social entrepreneurs in India. 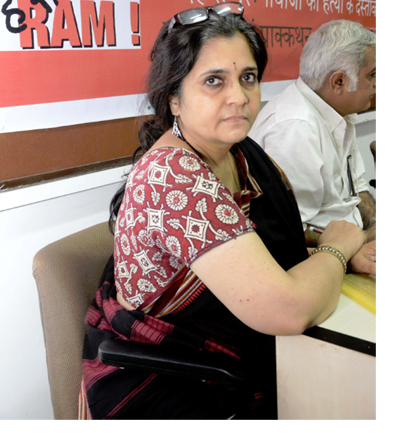 The Central Bureau of Investigation (CBI) on Tuesday conducted searches at three locations in Mumbai, including the residence of social activist Teesta Setalvad. The CBI officials conducted searches at the office of Sabrang Communications and Publishing along with the premises of Setalvad, her husband Javed Anand and associate Gulam Mohammed Peshimam. The agency took the step after it registered a case on July 8 against Setalvad, Anand and Mohammed for criminal conspiracy and illegal acceptance of foreign contributions for their company, Sabrang Communications and Publishing Pvt. Ltd. (SCPPL). The three have been accused of diverting foreign funds to SCPPL by violating the provision of the Foreign Contribution and Regulation Act (FCRA), 2010. The trio has also been booked under various sections of FCRA 2010 and Protection of Civil Rights Act. "The allegations are of criminal conspiracy for illegal acceptance of foreign contribution without registration and prior permission from the ministry of home affairs," an official told IANS. Anand, Setalvad and Mohammed are directors of SCPPL, based in Santa Cruz in Mumbai. Assuming Teesta Setalvad has mis-appropriated part or all of 1.5 crores that is a small price to pay for putting 100 people in jail in the Gujarat pogrom or genocide. All "sickulars" will feel hopeful of the nation's future now that political parties have seen the consequence of their murderous ways. AS Teesta pointed out the Mumbai political party responsible for 1992 riots got away with genocide. Thanks to her intervention the likelihood of Mumbai and Gujarat being repeated is greatly reduced ? Is CBI the normally designated authority for investigating breach of FCRA ? If not this is shocking and deeply disturbing abuse of the law and the Supreme Court must take suo moto cognizance, particularly given that it has earlier noticed abuse of the law by authorities in Gujarat and afforded protection from arrest. 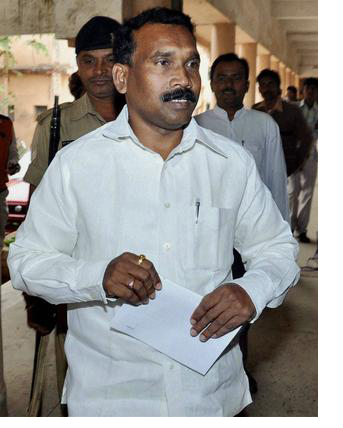 A court here on Tuesday ordered that former Jharkhand chief minister Madhu Koda and others be charged with criminal conspiracy and cheating in a coal block allocation case. The court found prima facie evidence against Koda and others in the case allegedly involving Vini Iron and Steel Udyog Ltd (VISUL). Special Judge Bharat Parashar ordered the framing of charges dealing with criminal conspiracy, cheating and various provisions of Prevention of Corruption Act against former coal secretary H.C. Gupta, Koda, Jharkhand's then chief secretary A.K. Basu and others. The charges will be formally framed on July 30, the court said. The court was hearing the case related to Jharkhand's Rajhara North coal block allocation to VISUL. The Central Bureau of Investigation has alleged Gupta, Koda and others conspired to favour VISUL in allocating the coal block. The others accused in the case include VISUL director Vaibhav Tulsyan, chartered accountant Navin Kumar Tulsyan, government officials Basant Kumar Bhatacharya and Bipin Bihari Singh and alleged middleman Vijay Joshi. They have been charge-sheeted for cheating and criminal conspiracy and under the provisions of Prevention of Corruption Act.